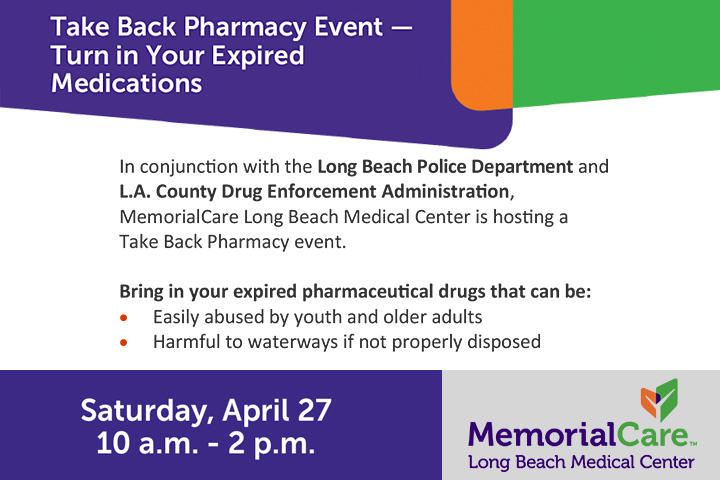 Long Beach Memorial Medical Center will host a Take Back Pharmacy Event from 10 a.m. to 2 p.m. Saturday, April 27 at 2801 Atlantic Ave., Long Beach. Expired pharmaceutical drugs can be abused by youth and older adults, and the substances may harm waterways if not properly disposed. The drive-through, drop-off event is provided in partnership with the Long Beach Police Department and the Los Angeles County Drug Enforcement Agency. Enter Memorial Medical Center Drive off Atlantic Avenue and look for drop-off location signs.